Having a foot or lower leg injury is no fun. You lose most of your independence; you cannot walk for a while, and you cannot even complete most basic tasks. However, you have a few options at hand that may give some of your mobility back. You can go for a knee scooter, but not everyone can afford those. Also, a knee scooter requires you to bend your knee, and if you have your entire leg in a cast, that is not possible. That is why plenty of individuals choose to purchase a pair of crutches. They are affordable, most of them, and as long as you do not use them for an extended period of time, you should handle it. At first, the axilla crutch was the only option for all those who suffered a leg injury. There is nothing wrong with that, but that is only as long as you have to use them for a short period. Prolonged exposure to under arm crutches can lead to nerve damage in the area, which is not ideal. As time went by, manufacturers came up with new ways to make crutches that can be used for longer. Here is what you can choose from. Axilla crutch – everybody knows about this type. It used to be the most commonly used model, but as new models came in, people forgot about them. It is easy to understand why. The axilla crutch can lead to under arm nerve damage if used for a long time, and they are not very comfortable either. Your arms can go numb, and it becomes quite painful after a while. Usually, the axilla crutch is the least expensive crutch. Open cuff crutch – you could say that the open cuff crutch is the most comfortable. Your arms sustain your body weight, and your underarms stay untouched. It is not painful at all, and once you get the hang of it, these crutches become like an extension of your hands. They are easy to use, and there is no long-term damage. Open cuff crutches are also known as elbow crutches, forearm crutches or Canadian crutches, and doctors will recommend this model to people who have weaknesses in their arms but to people who suffer from carpal tunnel syndrome as well. The handgrips need to be at the same level with your wrist bone, and some models come with an adjustable elbow cuff. Closed cuff crutch – this is very similar to the open cuff crutch. The only difference is that the elbow cuff is closed. It surrounds your entire arm. Some people choose this model so that they do not drop the crutches easily. Before deciding on the type of crutches you want, ask your doctor what the best choice for you is. Also, take into consideration for how long you are going to be using them. If you need them for long, then open cuff or closed cuff crutches are the best way to go. Keep in mind that these two models are less tiring than the axilla crutches. According to a study, they will cause the less oxygen consumption. What is the best choice: forearm crutches or underarm crutches? At the end of the day, the choice is yours. However, make sure that you take into account what your doctor says, and do not forget to do your homework. After all, you are stuck in that position for a few weeks, and you need to be as comfortable as possible. Otherwise, what is the point? For the sake of you getting all the information, below you will find a comparison between the two types of crutches. The comparison is made according to comfort, posture, strength, and coordination. In my opinion, those four are the most important aspects of your recovery. Comfort – as far as comfort is concerned, you should know that the underarm crutches can be painful if you use them for a long time. They press against the side or your body, and you can get some severe soreness and abrasion. They have padding, but no amount of padding will be able to spare you the pain on the underarm area. Forearm crutches, on the other hand, are designed to reduce pressure on your wrist when you move, and the elbow cuff will spare you the pain in your underarm region. In fact, the cuff goes nowhere near that area. The point here is to understand that as comfort goes, forearm crutches are the way to go. Posture – you may think that posture has nothing to do with your recovery, but you want to get out of your situation better, not worse. Posture has something to do with that. I say that because most people who use underarm crutches tend to slouch over them. As you may already know, that is a bad habit that hurts your back and causes muscle strain in the long run. Forearm crutches will prevent that from happening. For one, slouching is not possible with forearm crutches. Secondly, the better your posture is, the more comfortable the crutches will be. You could say that forearm crutches encourage good posture, which is why I think that they are the better choice. Strength – when it comes to the needed strength to move around, underarm crouches win. I say that because they require less effort to use. Both types require upper body strength, but forearm crutches need more that underarm crutches. In the end, it is you that will decide. If you can develop the muscle strength you need, then forearm crutches are fine, but if you have a weak upper body and you do not need to use the crutches for too long, then underarm crutches are what you need. Coordination – when buying crutches, you cannot overlook the coordination aspect. What you should know is that underarm crutches are very easy to use, and you get the hang of using them pretty quickly. There is no learning curve there. Forearm crutches are another story. You will need some time to master them. You may even need some help. It is up to you to decide whether you have the strength and the will power to do so. Remember that forearm crutches are better in the long run, and the effort of learning how to use them may be worth your while. Moreover, once you get the hang of forearm crutches, you will be able to move better, and your mobility will be improved significantly. Now that you have all the information at hand, you can make a smart decision. Remember that it is is you who matters, but listen to your doctor as well. He or she is the best qualified to tell you what you need and why. What are the best crutches? Since there are so many crutches out there, choosing a pair may be confusing. However, as long as you know what you want and need, it should not be so difficult. Even so, here are three excellent suggestions that should satisfy your needs. The crutches from Hugo Mobility are among the most affordable solutions on the market. Not only that, but they are made of high-quality materials. It is safe to say that the quality-price ratio is incredible. Moreover, this model is one of the most popular products in this category, and thousands of people are satisfied with their choice. These underarm crutches are recommended to people who are recovering from a leg injury and do not need to spend too much time on crutches. As I said above, underarm crutches are not recommended for long periods. This model is lightweight, even lighter than wood. It is made of anodized aluminum, which means they are also very durable. They can support up to 300 pounds. What is even better is that they are adjustable. They can fit a medium-sized adult. These crutches can fit a person who measures between 5’2’’ to 5’10’’, but you can also find the same model for tall adults and children. The adjustment can be achieved with the help of a dual push-button. The tips of the crutches provide excellent traction and feature a curved stair deflector. At the same time, the metal ring is meant to protect the tip from wearing. The Hugo crutches come with padded underarms for more comfort, and the hand grips are made of a natural sponge cushion. Although the grips are perspiration resistant, we all know that they can get dirty fast. That is why the manufacturer made them washable. Click here to read more reviews and buy on Amazon. When you first take a look at these crutches, you may have your doubts. It is true that most axilla crutches do not look that way, but these come with an ergonomic design that is meant to make you feel more comfortable than with the traditional underarm crutches. According to customers’ reviews, they manage to do that. Not only that the shape of the crutches makes them more comfortable, but they also feature an innovative spring action that absorbs impact and propels forward. That way you use less energy than usual. The grip also has an ergonomic design. That will keep your hands in a neutral position. As a result, your blood flow will be normal, and your nerves will not be damaged. It is a brilliant solution for a very old problem. The padded underarm will eliminate the risk of soreness and abrasion, and you can be comfortable even if you use the crutches for a long time. One of the features you are going to love about these crutches is that they fold. When you do not need them anymore, instead of leaving them behind the door, you can just fold them neatly and store them in a small space. You can find this model in two available sizes: short and tall. These sizes fit people who measure from 4’7’’ to 6’10’’. Click here to read more reviews and buy on Amazon. If you decide that standard underarm crutches are not for you, then you have to check out the forearm crutches from Ergoactives. They are one of the best crutches money can buy, and there is not a single person who has a complaint regarding their use. They are comfortable, they have an ergonomic design, and they are suitable for all those who suffer from a temporary injury to chronic issues. 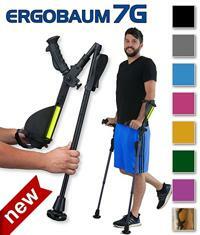 The Ergobaum crutches are state-of-the-art, and purchasing them may be the best idea you ever have. The Ergobaum crutches come with numerous features that are meant to improve the quality of your life for the time being. 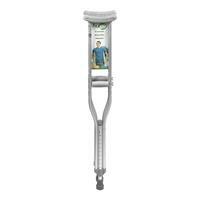 The shock absorbers located in the tips will reduce impact, which means you are not going to feel any pain associated with crutches usage. The Ergobaum’s spring shock absorber technology has been patented. The Ergocap high-performance crutch tip provides excellent balance and traction. The forearm crutches from Ergoactives come with a few extra features that you are going to love. There is a nightlight that is supposed to guide your steps during the night, a horn, and safety reflectors. However, one of the best features is the knee-rest platform. They are positioned on both crutches, and they provide excellent support when you get tired. The cushion grip is adjustable, and the model is foldable. When you are done, you can just fold the crutches and store them with ease. Click here to read more reviews and buy on Amazon. Given the fact that I find underarm crutches terribly uncomfortable, my recommendation is to purchase the Ergobaum Prime by Ergoactives. It has everything a pair of crutches should have. They are comfortable, adjustable, foldable, and they are easy to use. In my opinion, these are among the best crutches ever manufactured.